Get rid of an annoying fool looking for a troupe. Talk to Miun-Gei about an Annoying Fool. (Optional) Listen to rumors about a New Play. Talk to Crassius Curio in the Curio Manor. Return to Marcel and then Miun-Gei. Miun-Gei, an enchanter in Vivec's Foreign Quarter Lower Waistworks, is having trouble with an annoying fool loitering outside his shop. The fool, Marcel Maurard, just outside Miun-Gei's shop, will tell you that he is an actor looking for work and merely selling things to make ends meet. You can attempt to persuade or threaten him to leave, but he won't budge (short of killing him, which rewards only 250 gold and provides a smaller disposition increase). Maurard does mention that he would leave if only he could find a theater troupe. If you ask around town about a troupe, you'll soon find out that Crassius Curio has just written a (questionable) new play and is looking to form a troupe. 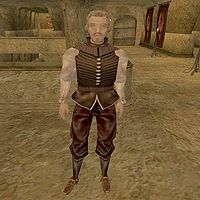 Curio can be found in the Curio manor in the Hlaalu Plaza in Vivec. Chat with the interesting Curio for a bit to find out some basic information about the play as well as receive an unfinished copy and then return to Maurard with the news. Once Maurard is taken care of, return to Miun-Gei for an Iron Shardskewer. His disposition jumps by 15 points, which should result in slightly lower prices. There is a bug with this quest in some versions of the game. If you kill Marcel and return to Miun-Gei, you will be rewarded with 250 gold; every time you talk with him you'll get the reward, non-stop. This is fixed in later game patches. There is another bug where Miun-Gei loses the dialog option about an "Annoying Fool" (unknown trigger, but not related to joining the Morag Tong). The quest (started through Latest Rumors dialog) will remain in the journal without a way to advance it. You can use the console to fix this (you will need to change the QuestStage to 20 and later on to 80 or 90 using the console, see Journal command in Console). There is yet another bug where if you start the quest with Miun-Gei, and then get the New Play dialog option with Crassius and he gives you The Lusty Argonian Maid book before talking to Marcel the first time, you will not be able to talk to Marcel about leaving, and thus cannot complete the quest in that manner. After Crassius gives you a copy of The Lusty Argonian Maid, if you drop it and talk to him again, he has the topic New Play back on his list, and if you choose it he will give you another copy of the book. You can do this over and over and get as many copies of the book as you like. 10 There is a rumor in Vivec that Miun-Gei, a merchant in the Vivec Foreign Quarter, has been having problems with an annoying street vendor selling things outside his shop. 20 I've spoken to Miun-Gei about the person outside his shop disrupting business. He claims the man is hawking ridiculous items, and generally annoying his customers. Since he technically isn't doing anything illegal, there is no way to get rid of him, but Miun-Gei would like him gone. 30 I've agreed to help Miun-Gei get rid of the annoying vendor, whose name is Marcel Maurard. 35 Finishes quest I've decided not to deal with the actor bothering Miun-Gei. 40 After speaking to Marcel Maurard, I've found that he is an aspiring actor, who is trying to make money to fund his craft. He refuses to leave, since it is the only way he has found to make any cash, at least until he can find a part in a play. 50 After asking around a bit in Vivec, I've learned that there is almost no actual theatre here in the city. In fact, the only one who is interested at all is Crassius Curio, a nobleman in town. 55 Crassius Curio is putting on a new play called "The Lusty Argonian Maid," and gave me a bit of the work to sample. 60 I have spoken to Crassius Curio, and it seems he is very interested in the arts, especially the theatre. He would like to stage a production of his latest play, but hasn't been able to find enough actors willing to take part. 70 Marcel Maurard was overjoyed to hear about Curio's play. He promised he would visit him as soon as possible and join with the acting troupe. 80 Finishes quest Miun-Gei was happy to hear that Marcel Maurard will no longer be selling his wares in front of his shop, and rewarded me with an iron shardskewer. 90 Finishes quest I've killed Marcel Maurard, and Miun-Gei is glad he's gone. He's not happy that the guards will be around asking questions, though. He rewarded me with 250 gold. This page was last modified on 24 October 2018, at 06:30.